Chronic deficiency constipation due to dryness or deficiency of fluid and blood. 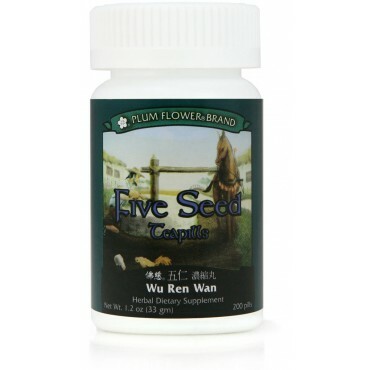 Helpful in constipation in the elderly or with weakness, postpartum and post surgery are some of the imbalances satisfied clients have used this product for. Citrus reticulata peel, Prunus armeniaca seed, Prunus persica seed, Biota orientalis seed, Prunus japonica seed, Pinus tabulaeformis seed. - Chen pi, Xing ren, Tao ren, Bai zi ren, Yu li ren, Song zi ren. Contraindicated during pregnancy. Contraindicated for complaints due to excess. Use with caution in hemorrhagic disorders or with individuals on anti-coagulant therapy. Contains tree nuts.